By our fourth full day in Cartagena, we’re completely at home in the city. I love that feeling when we’re traveling – that imprecise time when you go from being a stranger to knowing your way round and not feeling lost anymore. And with children it’s even better as they get to know the place too. So it is with Benjy who feels he can find his way around now with the best of them (in his case that’s me) and is quick to point out anyone else’s mistakes. We have our own morning routine after Liora goes early to class – Juan Valdez, Exito (usually more than once), bakery. And always a quick romp through the market just to catch the morning atmosphere. The waitress at GCB knows us too by now as this is our daily lunch haunt. That’s a great thing about being in one place for a longer stay than just a night or two – some locals will get to know you too. Evenings are spent sauntering around the old town looking for suitable dinner venues. One evening we eat upstairs at a Colombian restaurant above our square, Plaza San Diego. It is almost surreal to look at all the life below us on the streets. There are perhaps ten restaurants around the plaza, plus an informal crafts market in the middle. One of those moments to try bottle up and keep forever, but of course, life is not like that. Most of all we enjoy slipping into a pattern of walking the busy streets among the hordes, tourists and locals alike. There is an incredible amount of street life from vendors of juice, coffee, cigarettes, watches and anything else imaginable. It’s part of the wonderful, loud fabric of daily life in this incredible city. Today we visit Volcan Totumo, the mud volcano.It is probably the excursion we look forward to most, especially after last year’s amazing rip to Volcan Pacaya in Guatemala. The whole experience will prove to be one of the most unusual and bizarre in all my travelling experiences. We’re in a group of six from our Spanish school (we’re three of the six) as we arrive in a little minibus. The facilities are virtually nonexistent so we half undress in the vehicle and then in the tiny, relatively disgusting toilets. a swarm of bee-like creatures hovers everywhere and almost immediately one of the students is stung. We have to strip to the least possible clothing and carry nothing and climb about thirty steps up to the entrance. We can only enter one by one and have to be helped in by the men working at the volcano. 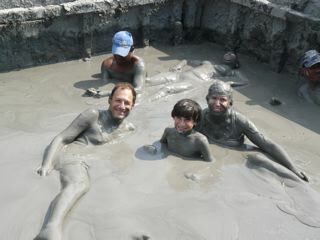 The volcano itself is actually more like a big mud pool and it is virtually impossible to move. It is also reputed to be over a mile deep, but it is also impossible to sink at all. The warders move you into lying position and then proceed to give you a massage. It is completely weird and really relaxing. Unfortunately though, the student who was bitten starts having a serious allergic reaction and begins to pass out. She has to be raced down to the bus and evacuated. The rest of us remain in the mud bath. Now apparently, the experience normally lasts about forty five minutes. Although we don’t know the time, it’s obviously longer than that, but our hosts do not want us to get out before our bus returns which could be at any hour. I desperately need to pee, but I’m stuck in every way. I’m hanging on for what seems like an eternity when eventually they instruct us to get out. We charge down to the lagoon next to the volcano – it is quite a sight to see the mud caked group prance down the stairs looking like something out of an early Woody Allen movie – where we are bathed by a group of women who insist we undress so they can wash out our bathing suits. They wash us all over before we are told to get back to our bus. Before we can leave, we have to pay everyone involved in our experience – massagers, photographers, bathers – and then we’re off. 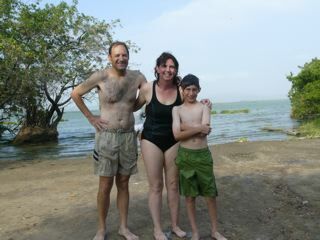 We pick up the student at a nearby hospital – she will be fine – and arrive back in Cartagena as the sun starts to go down. The bus drops us off at our school in the heart of Getsemani. We are greeted by a magical street scene. Kids are outside playing soccer in the street; grown ups are sitting outside their homes, shirtless, with radios blaring. This is not a view tourists often get while traveling – it’s so real, a celebration of the life we have seen in this amazing city.